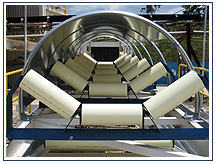 > Innoveyor has over 30 years of mining experience. > Innoveyor has a polymer chemist on staff. > Innoveyor has a strong affiliation with Wilvic Plastics and Certainteed. > Innoveyor has the ability to globally ship in 2-3 weeks. > Innoveyor performance is guaranteed. > Innoveyor offers a wide selection of cylinder material/bearing housings. > Innoveyor has engineered solutions for specific applications.